SORCERER Streams New Track "Ship Of Doom"
Swedish epic heavy doom metal warlords SORCERER will release their new album, The Crowning Of The Fire King, on October 20th via Metal Blade Records! For a preview of the record, SORCERER has now released a lyric video for the new single, "Ship Of Doom", which can be viewed below. The band comments: ""Ship Of Doom" captures the essence of Sorcerer. Slow, doomy and full of surprises for the listener. The music for this one was written by our very talented guitar player Peter Hallgren." SORCERER comments: "We have aimed to write an album with diversity and intensity, an album that we want to listen to ourselves. The Crowning Of The Fire King is by far our best recording ever with songs that are strong, powerful and doomy. 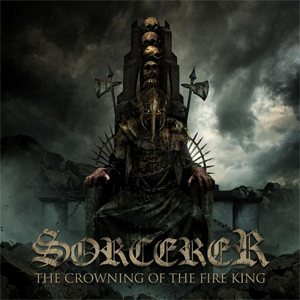 We have captured what SORCERER is about and taken the songs to the next level for the band."